The vast majority of visitors to Las Vegas gamble where they stay – on the Vegas Strip. According to the most recent Las Vegas Visitors Profile from the Las Vegas Convention and Visitors Authority 89 percent of visitors gamble on the Vegas Strip (page 44). Experienced gamblers know that the best blackjack games in Las Vegas can be found elsewhere. While 40 percent of visitors know to go downtown, very few explore the rest of Las Vegas. With that in mind, we’ll reference the most recent blackjack survey of Las Vegas casinos to find the best blackjack in downtown Las Vegas. Much like our look at blackjack on the Vegas Strip, we’ll look at traditional blackjack games (no variants like Blackjack Switch). These games all have a house edge under 1% and a minimum bet below $25. There are a lot of good blackjack games in downtown Las Vegas. Best of all, the limits are as low as $5 for these good blackjack games. Visitors to Las Vegas who love blackjack but only have a small budget should consider visiting a downtown Las Vegas casino. Once again, El Cortez has the single best game in downtown Las Vegas. The $5 single deck game has a tiny house edge of 0.30%. 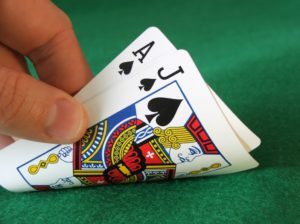 According to the blackjack survey, there are as many as 12 of these single deck games available. You won’t get rich from this blackjack game at the El Cortez. The pit bosses keep a close eye on these games and will shut a table at the hint of any shenanigans (as they see it). In other words, if they even think there are card counters the players will be backed off and the game closed. Funny story, a couple of years ago I had a table shut down because one of the players was winning too many side bets. Despite the eagle eyes, these games can be fun with a large group and the money lasts a little longer thanks to the small house edge. The majority of casinos in downtown Las Vegas have at least a few good blackjack games. Unfortunately, there are two casinos with no playable blackjack games. Binion’s and 4 Queens have the same owner and both offer the worst blackjack games in Las Vegas. Binion’s has 19 blackjack games with a house edge of 2.02%. Across the street, 4 Queens has 14 blackjack games with a house edge of 1.93%. In downtown Las Vegas there are a few very low limits blackjack games with a $3 minimum bet. These $3 blackjack games at the Fremont and California all have a house edge of 2.14%. This is the highest house edge for any traditional blackjack game in downtown Las Vegas. Just because some games are cheap, it doesn’t mean they’re a good value. There’s plenty of good value to be found once you leave the Vegas Strip.